Chris Traietti is an extremely busy individual, who is involved in almost every facet of boxing. He is a promoter that co-owns Granite Chin Promotions, a matchmaker, co-owner of a boxing/fitness gym TKO Boxfit, and also a cruiserweight fighter (23-4, 19 KOs). He will serve as fighter, promoter, and matchmaker for “Fight Night at the Bay” on Saturday, August 5th at the Marina Bay SportsPlex in Quincy, Massachusetts. The former WBC United States (USNBC) cruiserweight title holder takes on Nicholas Lavin in a scheduled eight-round co-feature for the vacant USA New England cruiserweight title. Traietti has scored two consecutive knockout victories following his ten-round unanimous decision loss to undefeated light heavyweight contender Mike Lee. This undercard will feature one-loss Derek Silveira taking on Michael Clark and world title challenger Aleksandra Lopez squaring off against Lisa Garland. This will be Traietti’s seventh fight in his last nine that will be showcased in front of his hometown fans. Granite Chin Promotions has been a part of almost all of Traietti’s bouts, even fights that he has not participated in, since 2011 when he formed the company at the young age of twenty-four-years-old, along with his dad. Granite Chin has steadily grown their presence and popularity throughout the New England region over the years, but after their sales revenue plateaued over their last couple of shows, Traietti decided to shake up things up. So, he added Chuck Shearns to the company. “In the short time that he has been involved with Granite Chin, Shearns has already provided significant contributions with his intense energy, great resources and connections, and unique perspective on different ways to promote our show,” said Traietti. In addition to fighting, promoting, and matchmaking, Traietti became a co-owner of a gym TKO Boxfit last May with super featherweight contender Ryan Kielczweski (25-3, 7 KOs). The gym is located on 50 Finnell Drive in Weymouth, Massachusetts, and it is more of a fitness gym, as opposed to a boxing gym. They offer a variety of boxing and cardio/fitness classes, as well as private and group lessons. 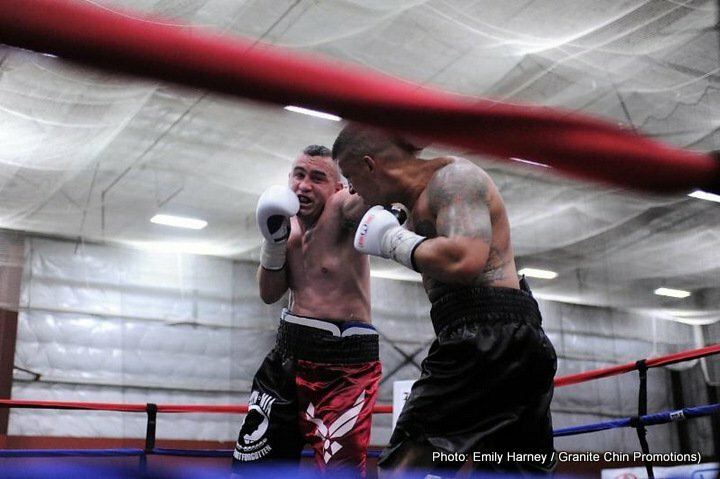 Despite all the work the former Iraqi War Veteran, puts in outside of the ring, he still finds plenty of time to focus on his boxing career and perfect his craft, as he looks towards putting together another long winning streak. He wants to fight two more times before the end of the year, once in September or October, and then again in December. Traietti is looking for one more opportunity to have a television bout in a significant matchup, in order to see if he still has what it takes to prevail and move himself up the cruiserweight divisional rankings into bigger and better bouts. An intriguing matchup to do just that, and one that he is extremely interested in making would be against local fighter Vinnie Carita (16-1, 15 KOs, unbeaten in his last thirteen bouts). Both fighters have good records and possess a lot of knockout power, which would lead to a great, exciting bout. “I have reached out to Carita’s camp a number of times about making this fight, but I have not heard back from them. I think this would be a fantastic bout, because the winner could elevate themselves to a significant fight and fans will certainly enjoy it,” said Traietti. Traietti had that potential career defining fight last September when he took on Mike Lee for the vacant USBA light heavyweight title on the CBS Sports Network. Going into that bout, he had scored eleven consecutive knockouts and for the first time in the last couple of years, he only had to focus on training, not promoting or matchmaking. Unfortunately, the bout did not go the way he wanted. He got knockdown in the second-round and was dominated, en route to a ten-round unanimous decision loss. The soon to be thirty-two-year-old, has actively planned for a successful career that keeps him connected to the sport he loves, once he does retire from fighting, which might not be for a couple more years. For the latest updates on Traietti and his upcoming boxing events, follow him on Twitter @Granite_Chin and on Facebook at GrantieChin. For more information on his gym, hours, and rates, visit them on Facebook or online at TKO BoxFit, and/or email them via tkoboxifit@yahoo.com or call them at (339) 205-6843.